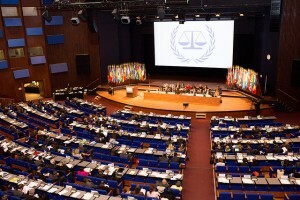 and the UN Security Council has the primary responsibility to enforce it.The Nuremberg Trials made it clear that criminal justice also has an important role to play for the promotion of peace and the deterrence of acts of aggression – though it remained limited and theoretical for many decades thereafter. With the 2010 Kampala amendments to the Rome Statute of the International Criminal Court, the promotion of peace through criminal justice has gained new momentum. States Parties to the ICC decided to empower the Court to hold leaders accountable who are responsible for the most serious forms of the illegal use of force against other States at the 2010 Review Conference in Kampala, Uganda. They adopted a definition of the crime of aggression, which is also expected to be incorporated into many domestic criminal codes. They thus created a new mechanism to enforce the most important rule of international law: the prohibition of the illegal use of force under the United Nations Charter. 30 ratifications, as well as a further decision by States Parties in 2017, are required for the ICC take up this new function. This website is dedicated to making this new accountability mechanism a reality. Finland 26th State to ratify the Kampala Amendments: On 31 December 2015, Finland deposited its instrument of ratification of the Kampala Amendments. It is the first Nordic country to ratify the amendments. This means that we need four more ratifications to achieve the milestone of 30 in the course of this year. Photo: United Nations/Win Khine. 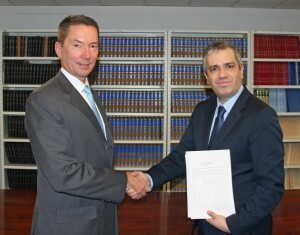 Deputy Permanent Representative of Finland to the United Nations, Jouni Laaksonen, meeting with the Chief of the UN Treaty Section Santiago Villalpando on 28 January 2016. To close the impunity gap, Benjamin B. Ferencz calls for prosecutions of aggressive war making as crimes against humanity: Writing in the Journal on the Use of Force and International Law, former Nuremberg Prosecutor Benjamin B. Ferencz offers a way to close the impunity gap on the illegal use of armed force by prosecuting it domestically as a crime against humanity. In his article entitled “The illegal use of armed force as a crime against humanity,” he encourages all States to ratify the Kampala Amendments to the Rome Statute, but, beyond that, to also, in exercising their domestic jurisdiction over crimes against humanity, to include the illegal use of force as an “other inhumane act.” Especially in today’s interconnected world and what he perceives as the obsolescence of absolute notions of sovereignty, Mr. Ferencz contends that a more law-centric approach is needed to counter the war-centric logic. The complete article is accessible on the website of the Journal on the Use of Force and International Law (subscription). A free-to-access HTML version is also available in English, French and Spanish. You can also find out more about the illegal use of force as crime against humanity on our website. Lithuania 25th State to ratify Kampala Amendments: On 7 December 2015, Raimonda Murmokaitė, Permanent Representative of Lithuania to the UN deposited her country’s instrument of ratification of the Kampala Amendments. The date was symbolic, as it was the 74th anniversary of the attack on Pearl Harbor. 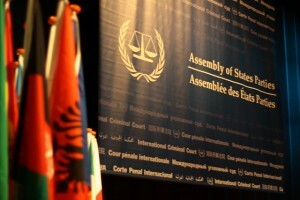 Sebastiano Cardi, Vice President of the Assembly of States Parties to the Rome Statute witnessed the event. All three Baltic States have now ratified the amendments. The Eastern European region as a whole also continues its leadership role in the ratification of the Kampala Amendments: half of all Eastern European States Parties have now ratified the amendments, with the remainder having pledged to do so soon. With several other domestic ratification processes complete or nearing completion, we remain on track to achieve the milestone of 30 ratifications in 2016. Lithuania, Finland close to ratifying Kampala Amendments, many more supportive at Assembly of States Parties: At a Side Event organized by Liechtenstein and the Global Institute on the Prevention of Aggression, Lithuania announced that its domestic ratification procedures had been completed, and that it would soon deposit its instrument of ratification to the Kampala Amendments with the Secretary-General. The process in Finland was also well advanced, with ratification before the end of the year likely. Many States Parties also used the opportunity of the General Debate to express their support for the amendments. Luxembourg, speaking for the European Union, noted the recent ratifications of the amendments. States including Botswana, Costa Rica and Uruguay called on States to ratify the amendments. Others, including Switzerland and Brazil, urged their early activation. All invited to discuss ratification and activation of the Kampala Amendments at Assembly of States Parties: The Permanent Mission of Liechtenstein to the United Nations and the Global Institute for the Prevention of Aggression invite all participants in the fourteenth session of the Assembly of States Parties to the Rome Statute to attend a side event entitled “Towards the activation of the Kampala Amendments on the crime of aggression.” The event will take place on Tuesday, 24 November at 9:00 a.m. at the World Forum Conference Centre in Europe 1 & 2. Please have a look at our upcoming events page for further details. We hope to see you there! 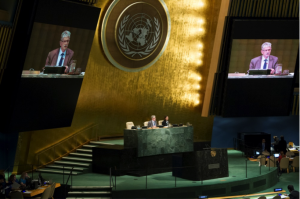 Widespread support for Kampala Amendments at UN debate on ICC: The Kampala Amendments on the crime of aggression were on the minds of many States Parties taking part in the annual debate of the United Nations General Assembly on the International Criminal Court. 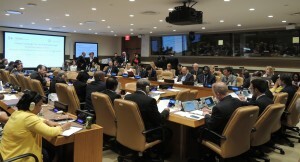 States, such as the 14 Member States of the Caribbean Community (CARICOM), welcomed the 24 ratifications of the crime of aggression amendments to date. Others, like Madagascar, renewed their commitment to an early ratification of the amendments. The newest State Party to ratify both sets of Kampala Amendments, Switzerland, called on others to follow suit – a call that was echoed by many other speakers including Liechtenstein. There was also a strong urge to activate the amendments as early as possible – a sentiment expressed by Cyprus, Brazil and others. The Kampala Amendments were also taken up by non-States Parties, with the United States and China reiterating their reservations. 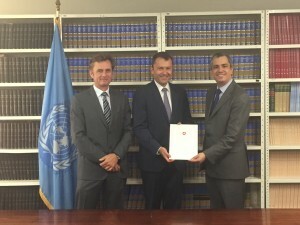 Switzerland ratifies Kampala Amendments as the 24th State: On 10 September 2015, Jürg Lauber, Permanent Representative of the Switzerland to the UN, deposited his country’s instrument of ratification of the Kampala Amendments. Switzerland was a key player in the negotiations leading up to the Kampala conference in 2010 and at the conference itself. Switzerland helped bridge gaps and thus ensured the successful adoption of the compromise. With 24 ratifications, we are getting closer to achieving the milestone of 30 ratifications in the near future. Photo: (from left to right) Christian Wenaweser, Ambassador of Liechtenstein to the UN; Jürg Lauber, Ambassador of Switzerland to the UN; Santiago Villalpando, Chief of the UN’s Treaty Section. Parliamentarians pledge ratification of the Kampala Amendments: At an event hosted by Liechtenstein, Parliamentarians for Global Action (PGA) and the Global Institute for the Prevention of Aggression, several members of parliament pledged to work to support the ratification of the Kampala Amendments within their own countries. 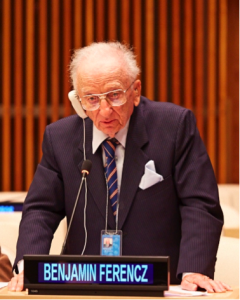 Parliamentarians were able to hear a video message from former Nuremberg Prosecutor Benjamin Ferencz, and listen to remarks by Albert Frick (President, Parliamentarians for Global Action), Felipe Michelini (former Member of Parliament, Uruguay) and Stefan Barriga (Deputy Permanent Representative of Liechtenstein to the UN). Speakers of the Parliaments of Madagascar and Senegal then offered commentaries, in which they underscored the importance of the Kampala Amendments and pledged to facilitate their ratification. After an interesting question-and-answer session, Mark Pritchard (Member of the UK House of Commons, Rapporteur of PGA) and Minou Tavarez Mirabal (Member of the Parliament of the Dominican Republic and President of PGA) gave concluding remarks. Home Sitemap This homepage is the result of a joint collaboration by the Principality of Liechtenstein and the Global Institute for the Prevention of Aggression.